The Battle of Gettysburg, was without a doubt the most famous and deadly battle fought in the Civil War with over 51,000 casualties. Although the Civil War continued for two long years after Gettysburg, it was a turning point in the war and the South was never able to recover from its losses. Every year millions of people visit this 6,000 acre shrine where so many men lost their lives and Lincoln gave his most famous speech, the Gettysburg Address. 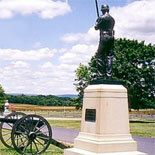 One of the best ways to experience this popular attraction is to take the Gettysburg Battlefield Bus Tour. Narrated by a National Military Park Licensed guide, this two hour tour is the most interesting and detailed tour available in Gettysburg. As you ride on a comfortable air conditioned bus you will watch history come to life and get a rare glimpse into the struggles of this bloody three-day battle. Among many other things you will see the statue of Robert E. Lee on top of the Virginia monument, the famous battle sites Little Round Top and Devil’s Den and the location of Picketts Charge where Lee ordered an infantry assault on the last day of the battle sealing the doomed fate of the Confederacy. If you are planning a trip to Gettysburg you must not miss this exciting and informative tour which operates every day, weather permitting, except Thanksgiving and Christmas. Explore the website and see the price section for any special deals that might be offered. Gettysburg National Military Park is a place where one of the most historically significant events took place that redefined our nation. It should be seen and remembered by all Americans.